Enjoy spectacular, 360-degree views of the Atlantic Ocean, the Intracoastal Waterway and more! 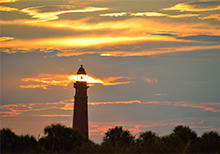 Completed in 1887, the Ponce Inlet Lighthouse is a fascinating piece of Florida history. It towers above others as the tallest lighthouse in Florida. This majestic facility, tucked away in the charming town of Ponce Inlet, stretches 175 feet into the sky. Feeling adventurous? Climb the 203 steps to the top for some truly breathtaking scenery and one-of-a-kind photo opportunities. The lush, surrounding grounds feature a wealth of historical and nautical treasures. 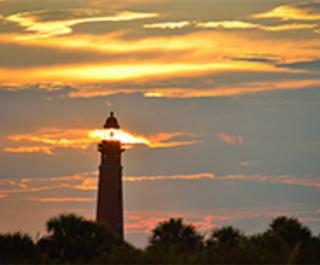 Ponce Inlet Lighthouse’s on-site museum features a rare Fresnel Lens exhibit, artifacts on lighthouse life, shipwrecks, a gift shop and more. Open daily, 10 a.m. - 5 p.m., with extended summertime hours. While you’re there, take a leisurely stroll and discover a children’s playground, boat ramps, casual restaurants, the Marine Science Center and other hidden treasures.